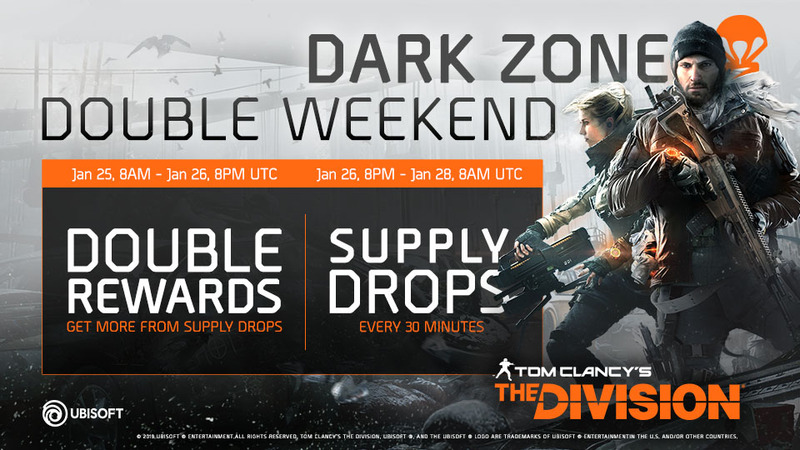 This weekend there will be an in-game event where Agents will receive twice the normal amount of rewards for Dark Zone Supply Drops, followed by Supply Drops every 30 minutes. Twice the normal reward for Dark Zone Supply Drops for the first 36 hours. Supply Drops every 30 minutes. As a reminder, Agents in the Dark Zone receive periodic alerts announcing Supply Drops touching down in the Dark Zone. Guarded by Elite enemies and a Named NPC, players have a limited time to claim drop rewards.